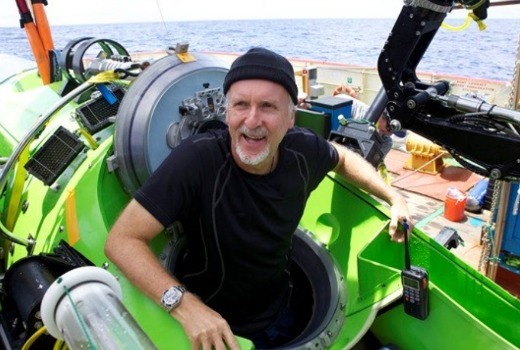 Next week SBS premieres the documentary, James Cameron’s Deep Sea Challenge, in which the film director and his team embark on a seven year project to uncover secrets of the ocean. This includes filming in Australia. There are places on Earth with no human history or memories, as remote from us as a distant planet. The deep-sea trenches are such a place. The deepest points on the planet, shrouded in eternal darkness, are home to an ocean’s worth of scientific mysteries waiting to be solved. Now, after years of painstaking work, a team of visionary engineers led by filmmaker James Cameron (“Avatar,” “Titanic”) has built a submersible that for the first time allows humans to visit the deepest part of this hidden world. It’s an astounding feat of technical wizardry, comparable in difficulty to landing a man on the moon. Deep Sea Challenge recounts the personal journey of Cameron and members of his engineering and science team as they prepare to make history, fulfilling lifelong dreams in the process. For Cameron, it is a journey told from within, with all his hopes and fears and dreams and frustrations laid bare. Based on a series of deep-ocean expeditions he undertook, Deep Sea Challenge is a unique and personal look at the multiple-Oscar® winner. It offers a glimpse into the passion he shares with the mission’s scientists to better understand our world. And it shows what drove him and his international team working in Australia, to take on the seemingly impossible task – in the end accomplishing what major institutes and governments could not. I saw this Doco at the movies towards the end of last year (at a special screening). I didn’t know much about it prior to watching it, but I was glued to it throughout the whole doco and really enjoyed it. So I do recommend this film for you to watch. PS – it was also nominated at this years AACTA Awards for Best Feature Documentary.